← GRNC Alert 4-28-13: Restaurant Carry Gets Vote on Tuesday! Help Fight-off Weakening Amendments! President Barack Obama on Monday will nominate Charlotte Mayor Anthony Foxx as his new transportation secretary, a White House official told The Associated Press Sunday. If confirmed by the Senate, Foxx would replace outgoing Secretary Ray LaHood. 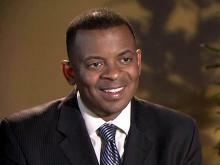 Foxx is Obama’s first black nominee among the new Cabinet members appointed for the second term. The president faced criticism early in his second term for a lack of diversity among his nominees.